Our Deko Finance option is available on courses, diploma course packages and qualifications amounting to over £299. 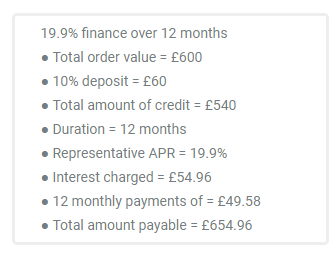 You have three options – to make repayments either over 12, 24, or 36 months at only 19.9% all with a 20% deposit. Our finance option allows you attend your chosen courses with us while making affordable, monthly repayments. You will find more information about the finance scheme below. Simply add the items you love to your basket. Once you are at the checkout select the finance option that suits you and then choose Deko. The quick application form should take no more than a couple of minutes to complete and you’ll receive an instant decision. Easy! • Have a good credit history with no late payments, debt relief orders, County Court Judgment (CCJs), Individual Voluntary Arrangement (IVAs) or bankruptcies. We offer a range of interest bearing finance options to help you spread the cost of your purchase over 12, 24 or 36 months. The value of the loan needs to be over £250 and you can choose a deposit of up to 50% of the value of the goods. Use our finance calculator to check the impact of various loan values, terms and interest rates on the total amount you need to pay and the monthly repayments. You can view the finance calculator, even before deciding to go ahead with a finance application. It’s a quick process! Simply select your chosen course(s) and add these to your basket. Once you have finished selecting courses, select the ‘Apply for a Payment Plan’ option. You’ll then be taken to the finance payment calculator allowing you to see a breakdown of the finance options being considered. Once you choose to go ahead, you’ll be prompted to complete a short finance request form, which takes just a few minutes to complete. If you have any questions or need any guidance regarding the finance or application process, simply give our team a call on Freephone 0800 999 2277 or submit an online enquiry through this page. Once we receive your finance request form, our team will be in touch by phone on the same working day to check your details and see if you have any further questions. If you decide to go ahead to make a finance application, our team will email over a link to apply for the finance online directly through Deko. Once you have completed the online application, you will receive an instant decision based on the information given and subject to status. If accepted, you pay your deposit straightaway directly to Deko as prompted and our team will then be in touch on the next working day to confirm your training dates with you and finalise your course enrolment. Should you be unsuccessful, our team will give you a call to discuss other options with you. Your first direct debit payment will be taken about a month after you commence your course (begin accessing your online course materials and/or attend a training day as applicable). This will show on your statement as a payment to your lender. You have the right to repay all or part of the loan early at any time. There is a 14-day cooling off period where you can withdraw from the credit agreement after signing your documents. If you wish to do this please contact us directly at [email protected]. You must request your cancellation in writing (by email) before commencing any part of your training course (online through our portal or before attendance of training is due or completed). We can cancel the application on your behalf. There is no need to contact Deko or your lender. Just contact us and we’ll cancel your application and the lender will refund your deposit and let you know of any outstanding balance; if applicable. A payment plan does not affect your statutory rights. More information can be found within our full terms and conditions. The Beauty Academy Limited, a company registered in England and Wales (company number 04176214) is authorised and regulated by the Financial Conduct Authority, register number 627016 and act as a credit intermediary. Finance is provided through the Deko platform by a number of lenders. You will be offered the best rate available based on your credit history and the lenders’ credit decision policies.